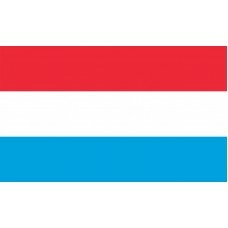 The Luxembourg flag features three horizontal bands in the colors of, red, white, and blue. It very closely resembles the flag of the Netherlands, the only difference being is the shade of blue that is used. The Luxembourg flag was first used on June 12th, 1845 (until 1830, the country did not have a flag) and adopted officially on June 23rd, 1972. The colors of the Luxembourg flag date back to the 13th Century coat of arms that was used which featured blue and white stripes with a red lion on top. Luxembourg is a country that has endured plenty of history and plenty of invasions. Now, it is the only country in the world that is a Grand Duchy (ruled by a Grand Duke or a Grand Duchess). It first became a Grand Duchy in 1815 and was ruled by the King. From 1815-1866, it was part of the German Confederation but gained full independence in 1867. Following their independence, Luxembourg remained politically neutral but still faced invasions during the wars. In 1914-1918, during WWI, Luxembourg was invaded by Germany during their battle with France and the country was used as a base by the Germans. Despite this, Luxembourg still remained independent. During WWII, Luxembourg, once again, was invaded by Nazi Germany and the country was treated as German territory. Due to so many invasions throughout history, walled towns were built as well as castles to protect all the citizens. 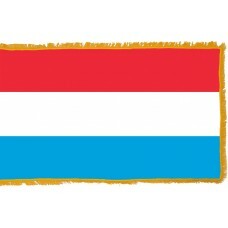 Luxembourg’s motto is "Mir Welle Bleiwe, War Mir Sin," which translates to "We Want to Remain What We Are." Their wish is to remain independent. Luxembourg is a landlocked country in Europe that shares borders with France, Belgium, and Germany. It is often referred to as "The Heart of Europe" due to its location. The capital of Luxembourg is called "Luxembourg City" and it was here that the first fortification was built in 963, known as "The Bock." It has been attacked and reinforced so many times throughout the years as Spain, Burgundy, France, and Prussia have all attempted to gain control. It is now one of the most popular tourist attractions that Luxembourg is home to. The capital is home to the historic old city which consists of many medieval buildings and fortifications and is proving to be a very popular place to visit, also for its ruins, underground galleries, and passages. It is also home to the walls of the Corniche which has been described as "the most beautiful balcony in Europe" which overlooks the old city. Despite all the invasions and tragedy, Luxembourg is now the second richest country in the world and home to over 150 banks. The lowest minimum wage is the highest in Europe and even though the cost of living is quite high, the economy is thriving. From foreign yoke and woe. On us now as of yore.